This image shows one of the largest known single objects in the universe, the Lyman-alpha blob LAB-1. 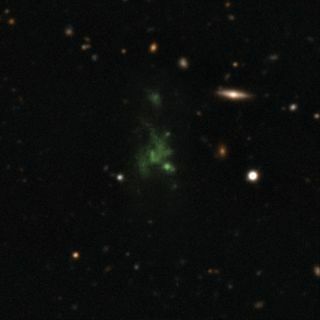 The intense Lyman-alpha ultraviolet radiation from the blob appears green after it has been stretched by the expansion of the universe during its long journey to Earth. These new observations show for the first time that the light from this object is polarized. This means that the giant "blob" must be powered by galaxies embedded within the cloud. A giant, glowing blob of gas – a cosmic relic of the early universe – is lit by galaxies within it, according to a new study. "We have shown for the first time that the glow of this enigmatic object is scattered light from brilliant galaxies hidden within, rather than the gas throughout the cloud itself shining," lead author Matthew Hayes, of the University of Toulouse in France, said about the Lyman-alpha blob, a rare and brightly lit gas cloud structure that is among the largest known objects. A team of astronomers used the European Southern Observatory's Very Large Telescope (VLT), located at the Paranal Observatory in Chile, to study the Lyman-alpha blob. These huge structures of hydrogen gas are usually seen in regions of the early universe where matter is concentrated. The findings of the new study are published in the Aug. 18, 2011 issue of the journal Nature. Studying how light is polarized allows astronomers to discern how the light is produced. If light is reflected or scattered, it becomes polarized, and this subtle effect can be detected using very sensitive ground-based instruments. However, measuring the polarization of light from a Lyman-alpha blob is tricky, the researchers said, because the target is so far away. The astronomers used the VLT to study the blob for 15 hours, and they found that the light was polarized in a ring around the central region but that there was no polarization at the center. Lyman-alpha blobs can measure a few times larger than the Milky Way, and are as powerful as the brightest galaxies. The blobs are typically seen from vast distances, so they appear as they were when the universe was only a few billion years old. As a result, they are important for understanding how galaxies formed and evolved when the universe was much younger. Hayes and his team studied one of the first, largest and brightest known Lyman-alpha blobs – LAB-1, which was discovered in 2000 and is so far away that its light takes about 11.5 billion years to reach Earth. LAB-1 measures about 300,000 light-years across. Embedded within it are several primordial galaxies, including one active galaxy. The researchers said more of these blobs need to be examined to see whether the results obtained for LAB-1 are also true for them.